In this post, Hornsby Girls High graduate Iris shares her top 8 study hacks for scoring a 99.5 ATAR. Do you need to know the secrets to a 99+ ATAR? In this post, Hornsby Girls graduate and Matrix alumnus Iris Huang shares her top 8 study hacks for scoring a 99.50 ATAR. I performed best in Mathematics. I performed worst in English. Like a lot of HSC students, I had a calendar of ‘to-dos’ that I was determined to adhere to. 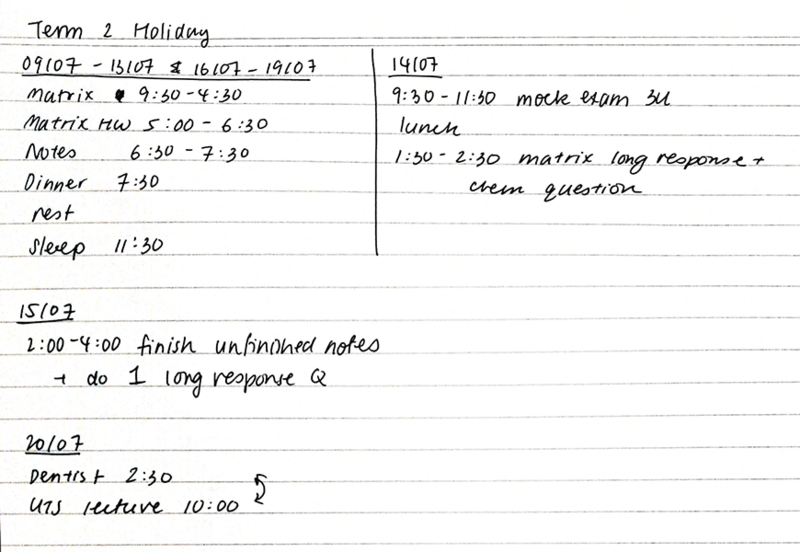 However, what I found the most difficult was actually sticking to what I believed was the ultimate study schedule. Looking back, I can see what I did wrong. I often found myself pushing things aside and not wanting to get started on my tasks, resulting in barely completing any of what I had planned. While it may be really tempting to schedule your favourite subjects today and least favourite in two days’ time, it will most likely cause you to procrastinate on those dreaded tasks when it is time to do them. ‘This is fine’ since I was still studying. In reality, I was still procrastinating. Instead, I should have definitely worked on that practice essay first so that I could have written it properly and not half asleep in the middle of the night! It was simply unrealistic for me to complete an entire practice essay in one night because it would take three hours to write just one paragraph. While that may not be the case for you, it is always important to consider what you are capable of doing and plan accordingly. This includes time for rest and exercise. I’d highlight things when I was done. In my schedule I did not study for more than 2 hours continuously and changed each day slightly so my life did not turn into a routine. I found that when I was able to complete what I planned, I remained motivated to continue the next day. Also, this means that you will not have a growing list of incomplete tasks as the week progresses. Whether something unexpected came up or you just could not finish all the things you wanted, always remember that your plans can (and probably will in some way) change. I found it extremely helpful to use a bright coloured pen when making changes on my calendar to ensure I did not change too much or pushed everything I was avoiding to be done later. I’d always keep my calendar and planner flexible and update as I went. Do not feel upset if you have to change your plans! There is only one way to follow your them exactly but an infinite number of ways to do them differently, so obviously, it is more likely that what you do is not what you initially planned. 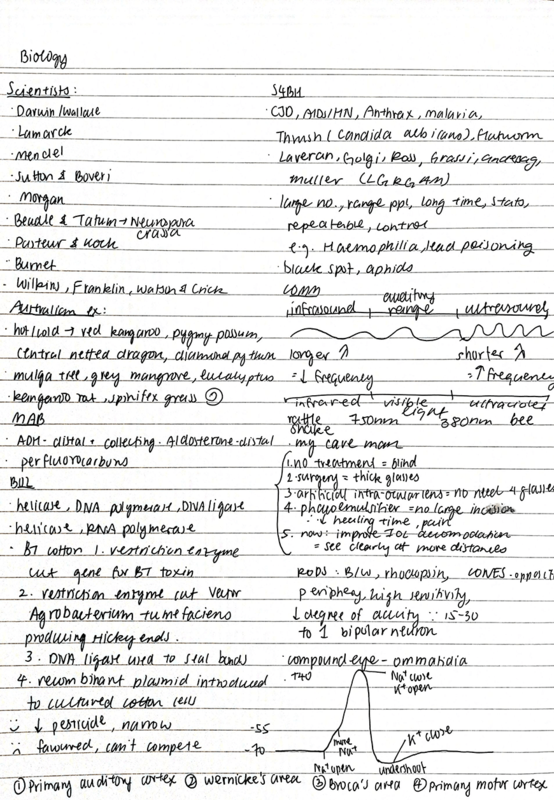 I prefered to write my own notes for Biology and Chemistry since it helped me remember the content. 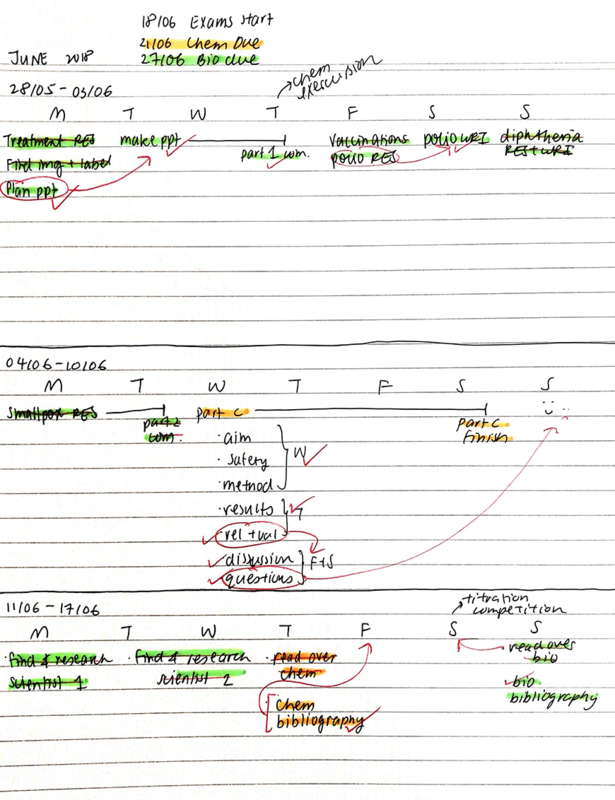 However, writing notes takes a lot of time and is not always an efficient way of studying. When year 12 first started, I would finish my notes a week before exams and feel unprepared as I did not practise many questions. To counter this, I wrote my notes in the holidays, way before exams started. 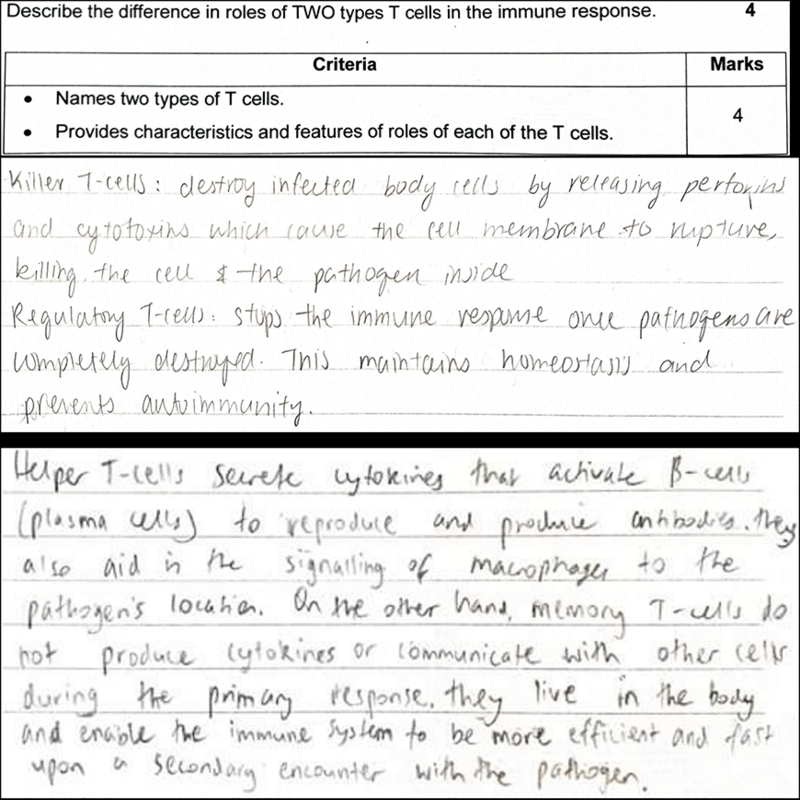 I went to the Matrix holiday course for Biology and Chemistry – this meant each day I spent six hours at Matrix, around two hours on Matrix homework and then an hour to write summary notes for content learnt that day. I got home at 5pm after Matrix, studied until 8pm and then spent the rest of the night doing whatever I wanted (since it was the holidays!). 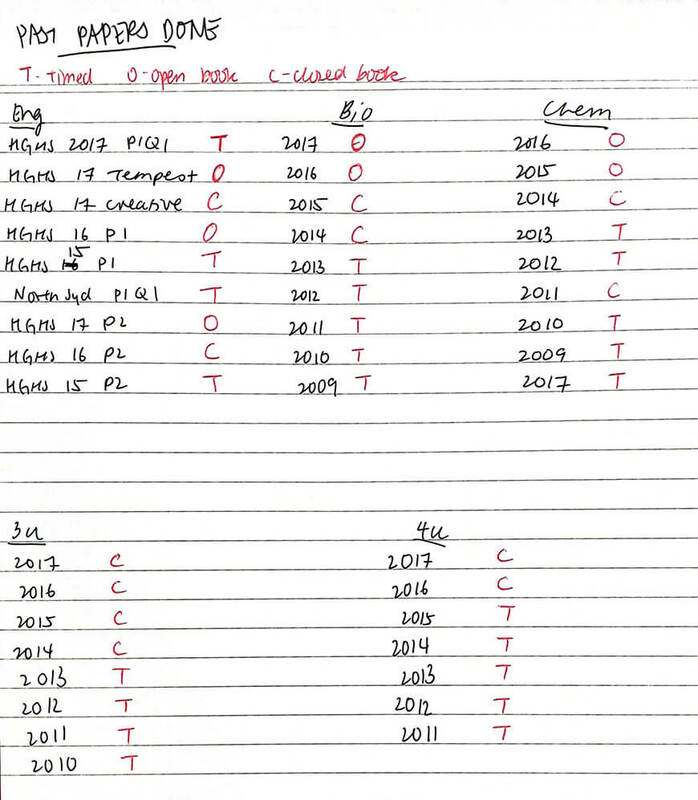 I’d always plan to include practice papers into my study routine. When school started, whatever I worked on in class was like revision and I could spend time on practice questions and past papers after school. If I had any questions I was unsure of, I would ask my teacher the next day. 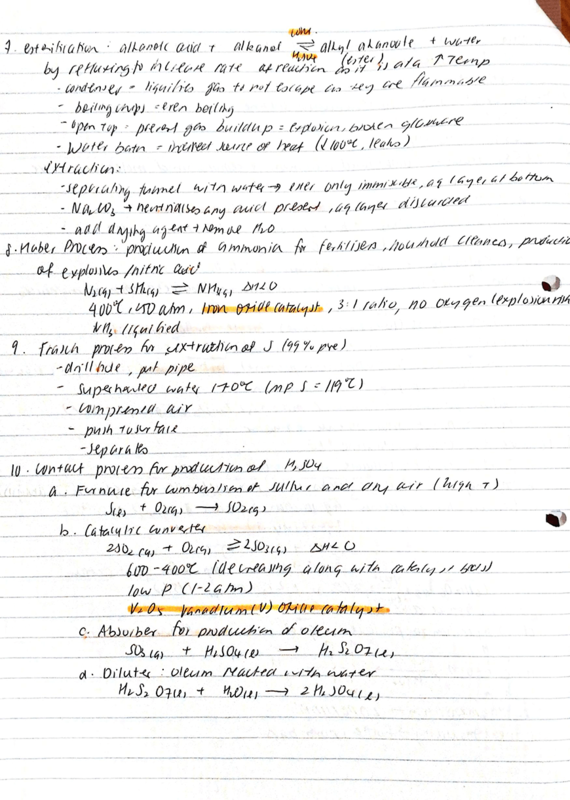 This way, I was able to write notes the way I liked and felt prepared when exams started. Countless times I found myself thinking ‘I’ll plan everything today and get started tomorrow’. This was my brain pointlessly trying to trick me into avoiding what I absolutely did not want to do. So, I restricted myself to spending maximum 10 minutes to plan and ensured that no matter how little, I always did some work on the day I was planning. 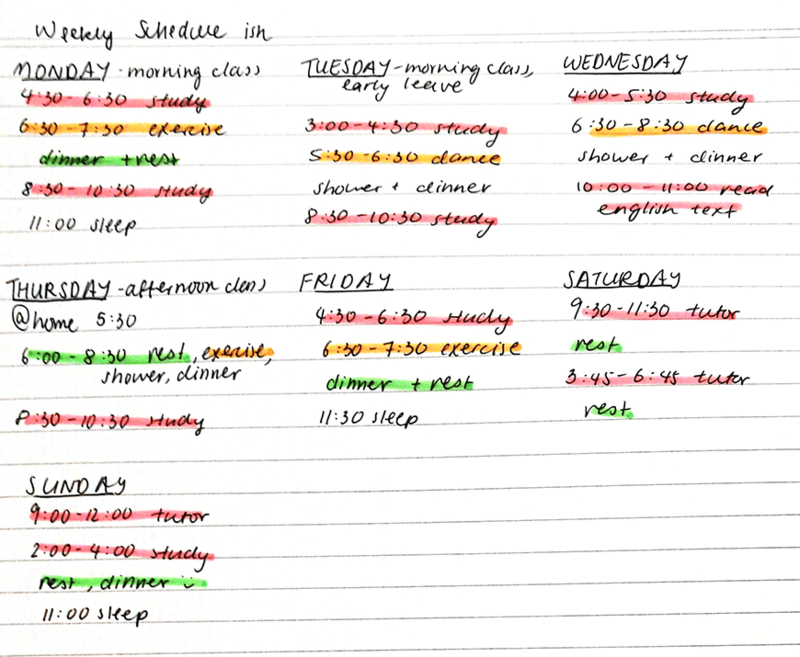 I would plan each week as they come instead of an entire term since it took less time and I have new tasks added daily. Open book: I did this when I first started a topic. This included checking my notes, textbooks or quotes (for English) when I was unsure. Closed book: I did this when concepts became more familiar. This ensured I could recall the content and express it in a way that answers the question. Timed: I did this around two weeks before exams. This meant with a timer for two/three hours, including reading time and with no distractions such as food or my phone. I’d mark off the past papers I’d completed to track my progress. This is heavily influenced by personal preference. I studied best in a small group of two to three people in a library. This allowed us to explain concepts to each other. If I could explain a concept to somebody else, it was highly likely I understood it very well. Then I could easily find areas where I was weaker in when discussing with others. I marked down weaker areas to work on in my own time. I regularly swapped completed past papers with a friend to mark. And reading other’s answers gave me a different perspective on the same question and showed me what I could work on. We kept each other on track! Our breaks did not become too long and we could motivate each other to keep working.Studying with a mate like this you learn different methods for doing things. For example, here are two answers for the same question. They have different content but both are adequate answers. I also preferred to answer short answer questions in dot points but full sentences are completely fine – it’s all up to personal preference! The night before the exam I would write a page of mini summary notes of things I usually find hard to understand or remember. Then I read it the next morning before the exam so I could easily revise without having to look through 100 pages of notes. I arrived at school at least half an hour before the exam just in case of any transport problems. Once at school, I found a quiet place to read through my summarised notes. There are few things I regret doing throughout the year. Once trials were over, I did not want to study. At all. Take a break, you deserve it after trials. I recommend around two weeks, but make sure you get back on track to prepare for your HSC exams. The HSC exams have the highest weighting in Year 12 and it requires adequate preparation. This took a major toll on my mental health, strained friendships and in general was a massive blow to my self-esteem. I set unrealistic expectations of my HSC using other people as a standard. You will not score 15/15 in English if you’ve been a consistent low B student. Do what makes you feel satisfied and work to improve yourself. Teachers tell you not to do it. Scientists tell you not to do it. Even your own sluggish body is telling you not to do it. Even if it is tempting to cram late into the night, from personal experience my sleep deprived brain remembers absolutely nothing. Get a good night’s sleep and wake up refreshed to learn the next day. I want to to help others learn from my mistakes, so here are a few bits of advice I’d wished I’d been told before I started Year 12. Realise and understand what did not work for you and try things differently next time. I tried using flashcards but that strategy did not work for me. Instead, I made those mini-summary notes! Cut down, but not completely, on extra circular activities. I enjoy dancing as a hobby but from year 11 to 12, I went from six to three hours of dance lessons weekly. This way, I still exercised but did not spend too much time at dance. Time flies when you’re having fun and before you know it, there is one week until exams. Stay aware of your time and plan accordingly. Do not put yourself down over bad marks but do not take good marks for granted. Put your mental health first. Find your perfect balance between studying and doing what you enjoy. A healthy mind is what keeps you motivated! That’s my experience and my advice, what you do now is up to you. Just remember, its okay to try many different things and fail, work from your mistakes and do what makes you feel happy! Today, I am who I am with all of my faults and my mistakes. Tomorrow, I might be a tiny bit wiser, and that’ll be me too. These faults and mistakes are what I am. Want to ace Biology like Iris? Get ahead of your peers like Iris did with our Year 12 Biology Accelerated Holiday Course. With advanced completion of contents before it’s taught at school, you’ll be well-prepared for your next assessment. Learn more about the Biology Accelerated Holiday Course.